Note: This op-ed was originally published in The Vancouver Sun on Sept. 4, 2015. I've been asked many times in recent months whether the Vancouver Board of Trade regrets taking a leading role in the Yes campaign during the transit plebiscite. With the benefit of nearly two months to digest the experience, I continue to respond with an emphatic "No regrets at all." So, too, do the business leaders on our elected board of directors, who unanimously voted to throw our weight behind the Yes campaign in a high-profile manner. This led to me assuming a co-chair role in the historic, diverse coalition that formed to support the mayors' plan. It has been our tradition for over a century to weigh in on (and often lead) complex and sometimes controversial conversations, particularly when the outcomes could transform the cities of this region. But beyond responding to that historic calling and taking a position on the matter, the plebiscite revealed a unique and compelling challenge facing our community in the long term. That challenge involves the unity of our voice as community-building business people across Greater Vancouver. 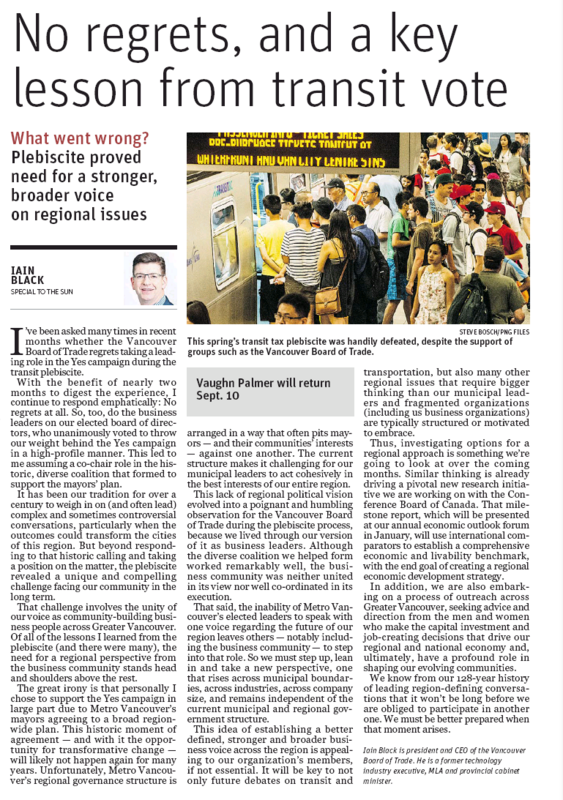 Of all the lessons I learned from the plebiscite (and there were many), the need for a regional perspective from the business community stands head and shoulders above the rest. The great irony is that personally I chose to support the Yes campaign in large part due to Metro Vancouver's mayors agreeing to a broad, region-wide plan. This historic moment of agreement — and with it the opportunity for transformative change — will likely not happen again for many years. Unfortunately, Metro Vancouver's regional governance structure is arranged in a way that often pits mayors — and their communities' interests — against one another. The current structure makes it challenging for our municipal leaders to act cohesively in the best interests of our entire region. This lack of regional political vision evolved into a poignant and humbling observation for the Vancouver Board of Trade during the plebiscite process, because we lived through our version of it as business leaders. Although the diverse coalition we helped form worked remarkably well, the business community was neither united in its view nor well-co-ordinated in its execution. That said, the inability of Metro Vancouver's elected leaders to speak with one voice regarding the future of our region leaves others — notably including the business community — to step into that role. So we must step up, lean in, and take a new perspective, one that rises across municipal boundaries, across industries, across company size, and remains independent of the current municipal and regional government structure. This idea of establishing a better defined, stronger, and broader business voice across the region is appealing to our organization's members, if not essential. It will be key to not only future debates on transit and transportation, but also many other regional issues that require bigger thinking than our municipal leaders and fragmented organizations (including us business organizations) are typically structured or motivated to embrace. Thus, investigating options for a regional approach is something we're going to look at over the coming months. Similar thinking is already driving a pivotal new research initiative we are working on with the Conference Board of Canada. That milestone report, which will be presented at our annual economic outlook forum in January, will use international comparators to establish a comprehensive economic and livability benchmark, with the end goal of creating a regional economic development strategy. In addition, we are also embarking on a process of outreach across Greater Vancouver, seeking advice and direction from the men and women who make the capital investment and job-creating decisions that drive our regional and national economy and, ultimately, have a profound role in shaping our evolving communities. We know from our 128-year history of leading region-defining conversations that it won't be long before we are obliged to participate in another one. We must be better prepared when that moment arises. Iain Black is President and CEO of The Vancouver Board of Trade. He is a former technology industry executive, MLA and provincial cabinet minister.